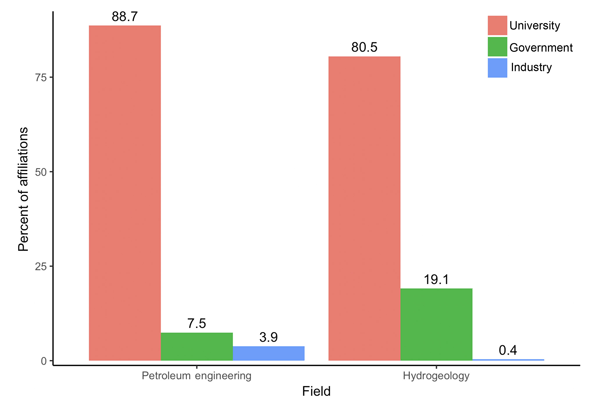 This paper addresses questions related to the adoption of stochastic methods in hydrogeology, looking at factors such as environmental regulations, financial incentives, higher education, and the collective feedback loop involving these factors. We show that stochastic hydrogeology's blind spot is in focusing on risk while ignoring uncertainty, to the detriment of its potential clients. The imbalance between the treatments of risk and uncertainty is shown to be common to multiple disciplines. Nitrate pollution of water resources stemming from intense agriculture is a persistent problem. In this study we compared the spatial and temporal patterns of Nitrogen(N)-input with the riverine N-export covering four decades of observations in three catchments in Central Germany. We found that the nitrate concentration in the river react to changes in the input with a time lag up to 17 years. Consequently, nutrient management should be aware of the slow riverine response to mitigation measures. We find that NSE-based model calibrations result in poor reproduction of high flow events, such as the annual peak flows that are used for flood frequency estimation. The use of KGE results in annual peak flow estimates that are better than from NSE, with only a slight degradation in performance with respect to other related metrics. Hydrological low flows are affected under different levels of future global warming (i.e. 1.5, 2, and 3 K). The multi-model ensemble results show that the change signal amplifies with increasing warming levels. Low flows decrease in the Mediterranean, while they increase in the Alpine and Northern regions. The changes in low flows are significant for regions with relatively large change signals and under higher levels of warming. Adaptation should make use of change and uncertainty information. We inspect the state-of-the-art of several land surface (LSMs) and hydrologic models (HMs) and show that most do not have consistent and realistic parameter fields for land surface geophysical properties. We propose to use the multiscale parameter regionalization (MPR) technique to solve, at least partly, the scaling problem in LSMs/HMs. A general model protocol is presented to describe how MPR can be applied to a specific model. We discuss the estimation of a long-term, high-resolution, continuous and consistent dataset of hydro-meteorological variables for Germany. 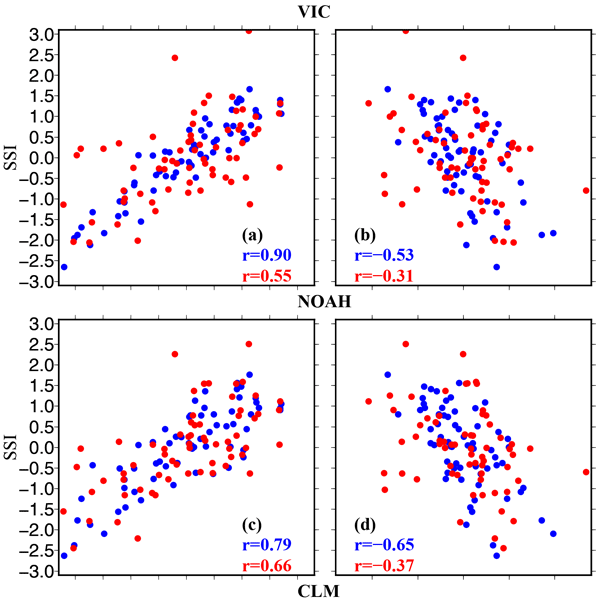 Here we describe the derivation of national-scale parameter sets and analyze the uncertainty of the estimated hydrologic variables (focusing on the parametric uncertainty). Our study highlights the role of accounting for the parametric uncertainty in model-derived hydrological datasets. A new method is presented which allows interpreting pumping test in heterogeneous transmissivity fields. Based on radially dependent transmissivity, the effective well flow solution is derived for two cases: the ensemble mean of pumping tests and the drawdown at an individual heterogeneous transmissivity field. The analytical form of the solution allows inversely estimating the parameters of aquifer heterogeneity (mean, variance, and correlation length) from steady-state pumping test data. The heterogeneity of landscapes in river basins strongly affects the hydrological response. 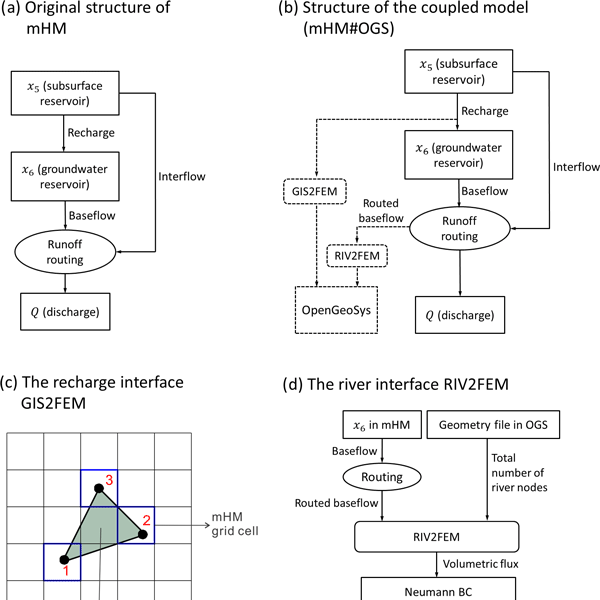 In this study, the distributed mesoscale Hydrologic Model (mHM) was equipped with additional processes identified by landscapes within one modelling cell. Seven study catchments across Europe were selected to test the value of this additional sub-grid heterogeneity. In addition, the models were constrained based on expert knowledge. Generally, the modifications improved the representation of low flows. In a maiden attempt, we performed a multiscale evaluation of the widely used SPI to characterize local- and regional-scale groundwater (GW) droughts using observations at 2040 groundwater wells in Germany and the Netherlands. From this data-based exploratory analysis, we provide sufficient evidence regarding the inability of the SPI to characterize GW drought events, and stress the need for more GW observations and accounting for regional hydrogeological characteristics in GW drought monitoring. This study helps hydrologists better understand the parameters in modeling seawater intrusion in a coastal karst aquifer. Local and global sensitivity studies are conducted to evaluate a density-dependent numerical model of seawater intrusion. The sensitivity analysis indicates that karst features are critical for seawater intrusion modeling, and the evaluation of hydraulic conductivity is biased in continuum SEAWAT model. Dispervisity is no longer important in the advection-dominated aquifer. The paper addresses the issue of sampling errors when using the ensemble Kalman filter, in particular its hybrid and second-order formulations. The presented work is aimed at estimating concentration and biodegradation rates of subsurface contaminants at the port of Rotterdam in the Netherlands. Overall, we found that accounting for both forecast and observation sampling errors in the joint data assimilation system helps recover more accurate state and parameter estimates. Our primary objective in this study is to provide a virtual environment that allows users to determine the value of geophysical data and, furthermore, to investigate how best to use those data to develop groundwater models and to reduce their prediction errors. When this has been carried through for alternative data sampling, parameterization and inversion approaches, the best alternative can be chosen by comparison of prediction results between the alternatives. A conceptual model of groundwater flow processes and mixing was developed using a combination of hydrogeochemistry, isotopes and multivariate analysis. The implementation to the case of Guadalajara showed that groundwater was classified into four groups: cold groundwater, hydrothermal water, polluted groundwater and mixed groundwater. A multivariate mixing model was used to calculate the proportion of different fluids in sampled well water. The result helps authorities in decision making.